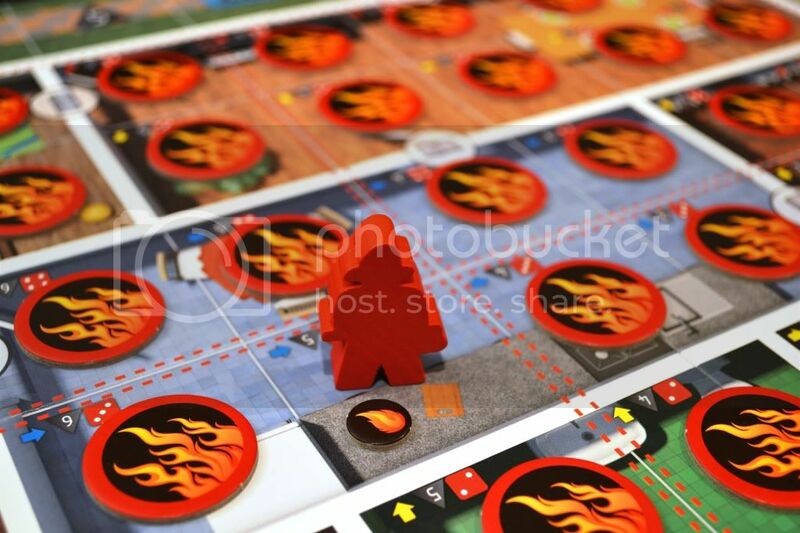 With the help of the Kickstarter campaign, no expense was spared in producing the components of Flash Point: Fire Rescue. Now, I don’t need to give a complete inventory of all the bits in the game (you can look at the rules for that), but I will call out a few things that stand out to me. The board is really nice, and making it double-sided is a really fantastic aid to replayability. It pictures an “easy” house on one side and then a more realistic ranch-style home on the other. As a KS backer, I also got the Urban Structures expansion, which has another double-sided board with two more buildings, but I haven’t felt the need to even use it yet because I haven’t at all felt that I’ve played out the core game boards as of yet. 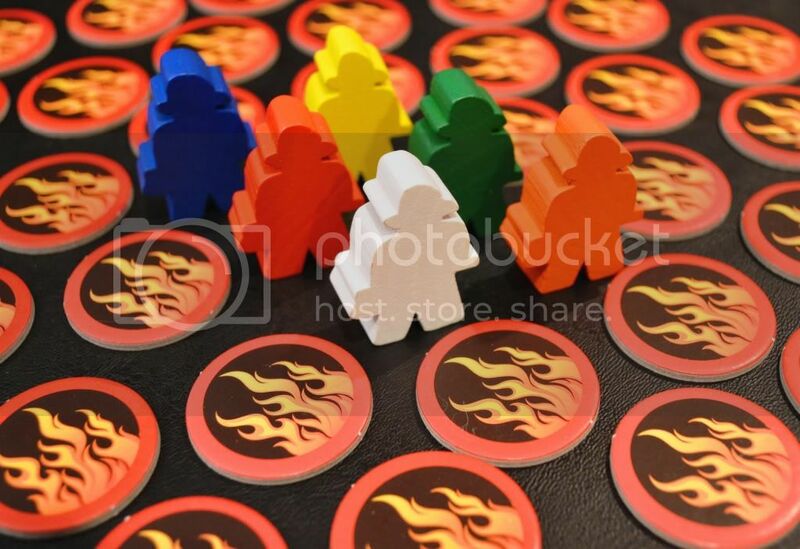 The most dramatic and iconic of the many, many cardboard tokens in the game are the Threat markers, which picture smoke on one side and fire on the other. 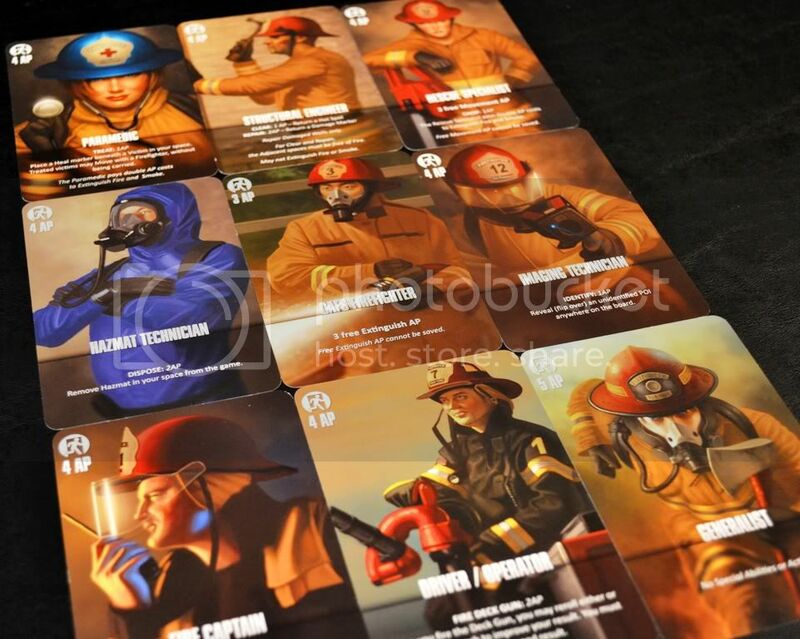 Between their artwork, color, and the way they seem to multiply all over the board, they do a really great job of evoking the threat that the growing fire poses to the firefighters. And overall, Flash Point: Fire Rescue is a darn pretty game. Especially when the game is in full swing and you’ve got fire raging through the house and explosions going on everywhere with valiant firefighters diving into the fray trying to save trapped victims anyway, it’s the kind of game that just makes people stop and watch. The goal of the game is to save at least 7 of the 10 victims in the building before the building collapses. So to do this, the firefighters need to keep the fire under control, make their way to the POI markers to see if they’re really victims, and then get them out to safety before they get caught in the fire and killed. If 4 or more victims are ever killed or if all the damage cubes are placed on the board, the players lose. • If the space already contains fire, you have an explosion! Explosions expand the fire out in all four orthogonal directions. If there’s already a fire token in a space, the explosion travels through it until it either hits an empty or smoke-filled space (putting a fire marker there) or hits something solid (doors or walls). Doors are immediately blown out (removed from the board) by explosions, while walls suffer 1 cube of damage (and rememeber, 2 cubes in any one wall segment totally destroys it). And if a firefighter is caught in the path of an explosion, they are knocked down, which basically just sends them to the Ambulance. An explosion at coordinate 4-4! 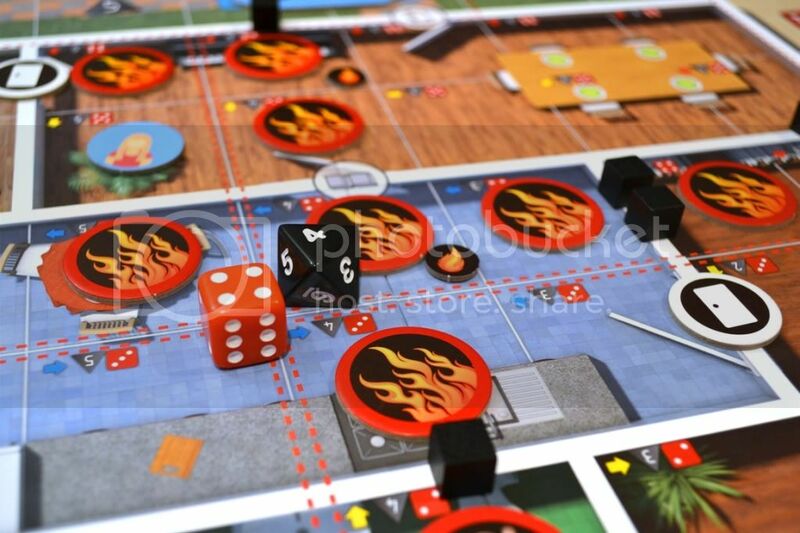 After placing the new Threat token(s) on the board, you then check for Flashover. This just means that any smoke adjacent to fire will ignite and flip over to fire as well. And since this can chain from space to space, it’s cool how one little spark can ignite a room full of smoke into a raging inferno in no time flat. At this point, if you have fire in any spaces with Hazmat markers, they explode as well. Then, if the spot you rolled contains a Hot Spot, you roll the dice again and start over with the whole process. And, of course, if a POI/victim is ever in the same space with fire, it is lost. The last thing you do on a turn is to check and see if there are 3 POI markers on the board. If any have been rescued, killed, or discarded (when a false alarm is revealed), you roll the dice and place a new facedown marker in that space. If the spot is already occupied by fire or a firefighter, there are actually some little arrows in each space that point you in the direction to place it instead. 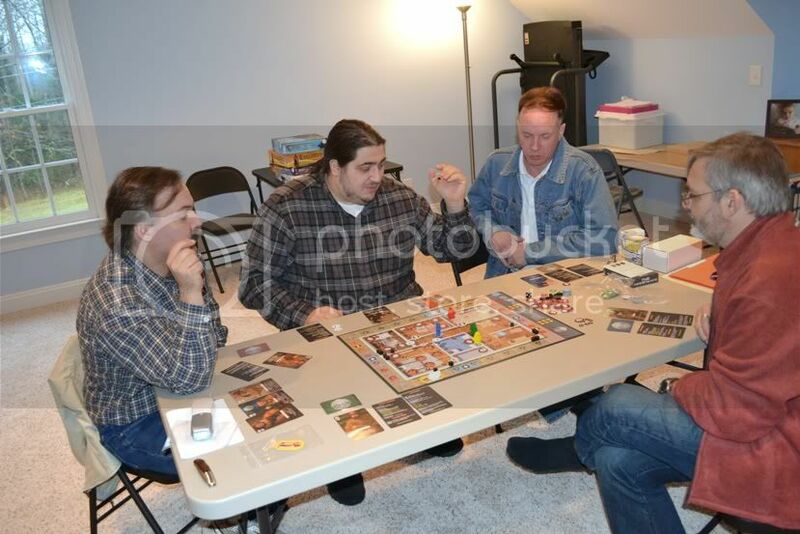 Players then take turns until you either rescue 7 or more victims and win, or you have 4 victims die or the house collapses, in which case you all lose. 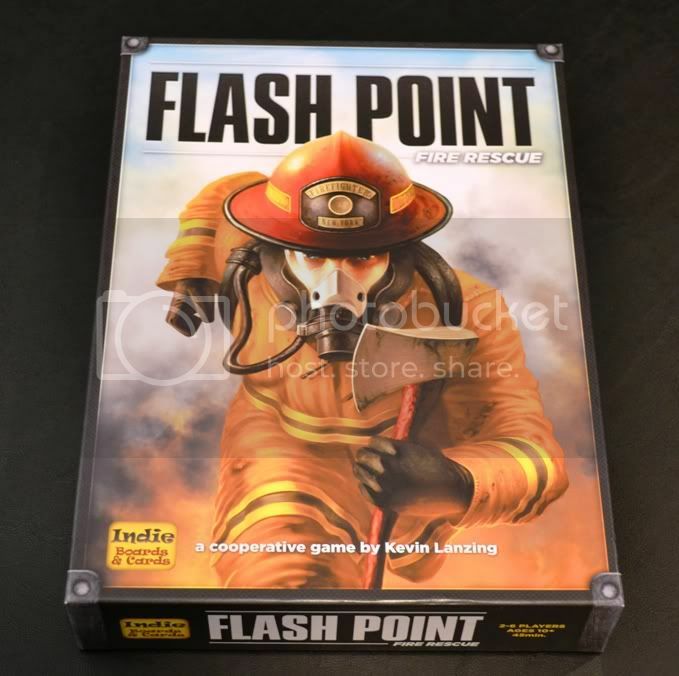 When I first played Flash Point: Fire Rescue, I actually felt a little disappointed by it. The main issue I have with the game is that the management of rolling the dice and placing new threat markers, handling explosions, checking for flashover, maybe doing the whole thing over again if you hit a Hot Spot, and then maybe rolling again to place a new POI or two… well, it can all get pretty darn fiddly. Especially for the first several times you play, you pretty much spend as much time doing all of this maintenance at the end of each turn as you do actually playing the game and making the choices of what to do with your action points. For me at least, as the person “running” the game all the time, it really tore me away from the theme and made the game more laborious than fun. 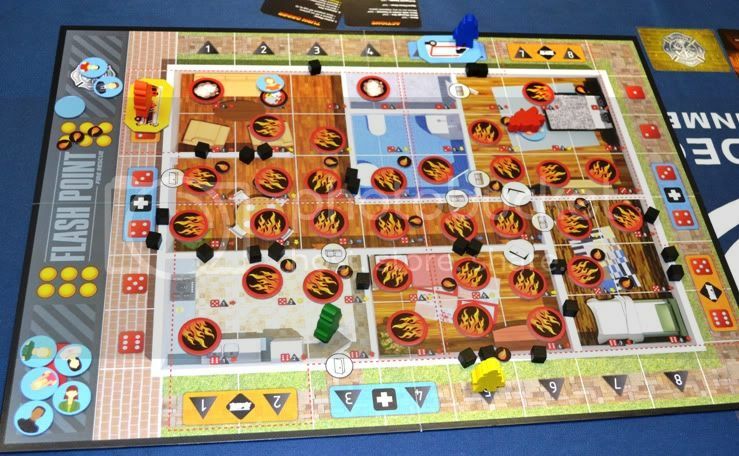 And in general, Flash Point: Fire Rescue definitely comes off feeling a little clunkier than a lot of other cooperative games that I’ve played before. At the beginning of the (experienced) game, for instance, there’s a lot of rolling the dice and putting things out on the board. But if you roll a location you rolled before, you have to roll again. And often again and again. More than anything, I think this lack of elegance is due to the designer attempting to make the game more realistic, which is not necessarily a bad thing, but it does sacrifice some level of smoothness in order to include this extra thematic chrome. The last thing I want to mention that may be somewhat negative is the level of randomness in the game. The difficulty of the game and even the effect of some player actions are determined, to a large extent, by the roll of the dice. But really, this is more just a matter of taste, and the random element is certainly “realistic” to the theme. But what about the freaking Theme? Even in trying to talk some about the negatives of the game, I couldn’t help but refer to the strength of the theme more than once. Because, really, Flash Point: Fire Rescue is all about theme. I mean, first and foremost, fighting fires is the sort of thing that you make freaking movies and TV series about! As much as I love good eurogames with typical euro-themes, if you can still have a solid game and make it about fire and explosions and saving people, how much freaking better is that? It’s relevant and interesting and exciting, and just talking about it to people makes them want to play. So in concept, the theme is all win. What’s even better is that the theme is actually implemented really well in the game. I’ve talked before about the difference between theme as metaphor and theme as narrative, and Flash Point: Fire Rescue actually does a great job with both. In terms of narrative, the game certainly tells a compelling story of the brave firefighters beating back the flames and risking their lives to find and rescue helpless victims. Probably because of the randomness in how the fire spreads, you have this nice blend between mounting tension (like when a room is filling with smoke and you know it’ll get ignited soon if you don’t do something about it) and complete surprises that take you completely off guard. If there’s any weakness to this, I can only imagine that most of the stories it tells will be very similar, even while no two will ever be exactly the same. But for me, the biggest strength of the theme is actually more about how it informs play. You don’t really have to tell new players what to do, because the choices you make as a player are pretty obviously what you would do if you were a real firefighter in that situation. 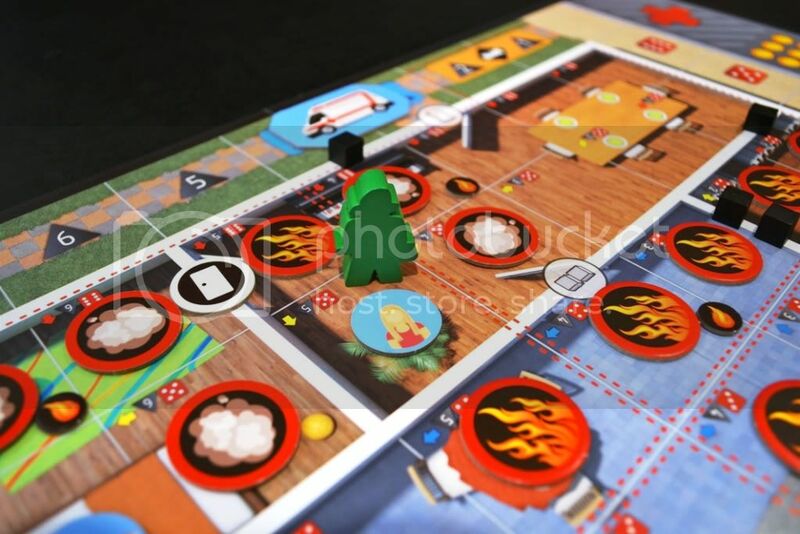 I am not a real firefighter, of course, and I’m sure that those who are would see a lot of abstraction and creative license being taken with the details, but from my perspective as an interested layperson, the game just feels right. The choices you make, even when trying to play strategically, mirror those of real life, and even the winning and losing conditions get right to the core of what’s important in a real fire. Another strength of the game is the inclusion of the different roles. So from the start of the game, each player has something very specific that they can do better than everyone else, which both gives them a niche to fill and also helps to give them direction about what they should be doing. And unlike some other games, players actually get to choose their role and, during play, can even switch to a different role if they want to. In terms of adding both replayability and additional strategy (in choosing different combinations of roles and even when to switch them), this is just brilliant. 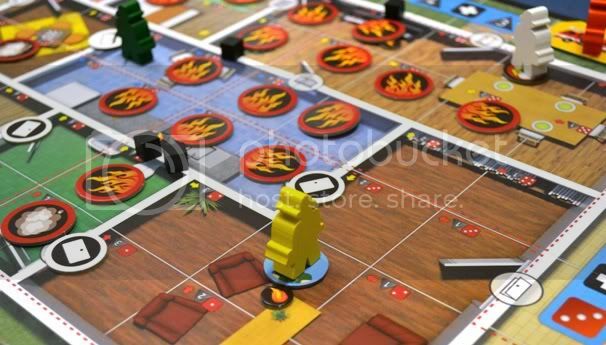 For the most part, though, Flash Point: Fire Rescue is a highly tactical game. On each turn, you pretty much have to assess what your priority needs to be and which fires you need to put out first (see what I did there?). You have to be flexible and respond to changes and make tough choices all the time. But at the same time, I also see a lot of room for players learning better and more efficient ways both of handling problems and working together, which I feel that I’ve barely even scratched the surface of myself. 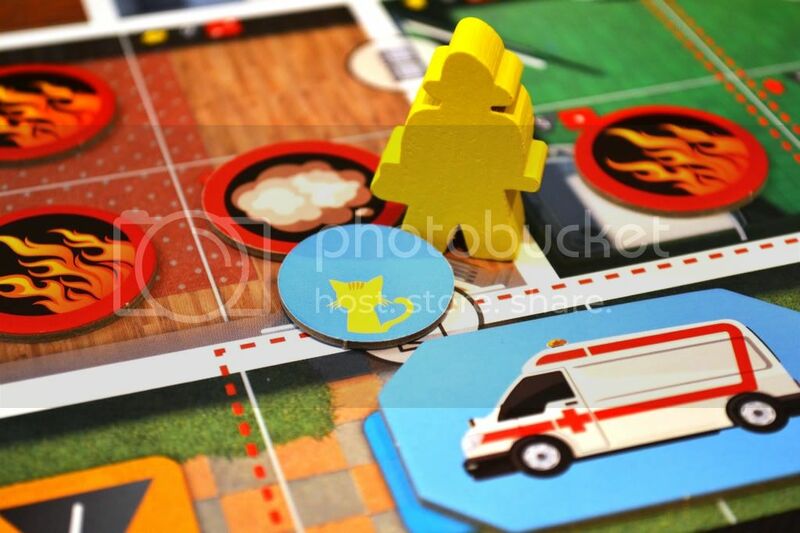 Pandemic is my favorite game, and in rating them against each other, Flash Point: Fire Rescue doesn’t really do anything to threaten that position. But while I prefer Pandemic for a lot of reasons, there are certainly a lot of things that Flash Point does better. I feel like I have a greater ability to affect the outcome in Pandemic since it’s less random, and it’s also a lot more elegant and seamless. But Flash Point is more flashy and intuitive, and is probably a little bit lighter overall if you’re looking for something more along the family-game lines. Ah, you beat me to it. I’ll be reviewing Flash Point in the next few weeks. I really enjoy both Flash Point and Pandemic, but I just see them as two completely different games. Pandemic is more of the strategy puzzle since you have an idea of which cities are more likely to be infected. Flash Point feels like a race against time, to me. The fire WILL rage faster than you can handle it and it’s all about getting the people out in time. Very fun. Still, I was looking for a nice family game. I’m gonna give this a try. Thanks for the review! Now I still have no idea if I want this game…. Previous Post: Gunship: First Strike is Live on Kickstarter!